Sometimes trips don’t quite work as planned. 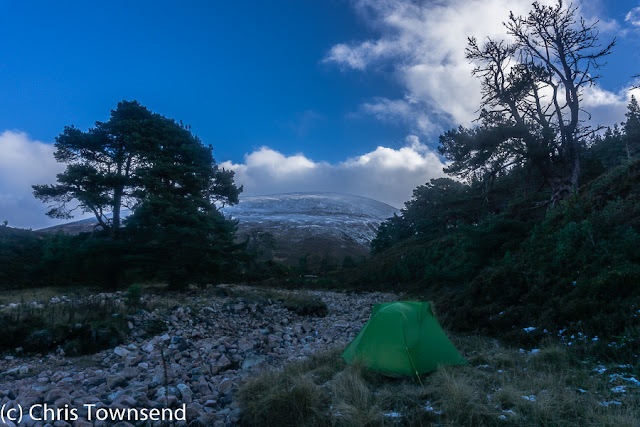 For my first overnight trip since returning from the GR5 trail in the Alps I planned to traverse the Moine Mhor plateau above Glen Feshie from Carn Ban Mor to Mullach Clach a’Bhlair and then descend back to Glen Feshie to camp. I always try and have at least one camp in the glen in the autumn. It’s beautiful year-round but the autumn colours and the stags roaring make this time of year special. The first significant snowfall of the autumn had fallen just a few days earlier and the summits were white and shining in the sunshine as I set off for the Cairngorms. Packing an ice axe and crampons seemed wise. Summer was definitely over. In Glen Feshie the bright yellow birches glowed in the late afternoon sun. Having been up until the early hours completing work the night before I was late to rise and slow to get going. I didn’t mind. The forecast was good and snow walking under the stars is always magical. Cold and unconsolidated the snow collapsed under my steps. Others had ploughed a path up to the plateau, making the walking reasonably easy even when the snow became shin deep. A cold breeze sliced across the snow chilling my face. To the west the sky was gold and orange as the sun set. Soon the sky darkened. Down Glen Feshie I could see cold white snowy slopes under a cold dark blue sky contrasting with the last warmth of the sun. I reached the plateau. The myriad boot prints turned away towards Sgor Gaoith. Towards Mullach Clach a’Bhlair there was just one set of holes in the snow. I set off and quickly realised this was going to take a long time. Stars shone. My headlamp beam lit up sparkling snow. It was magical but for once the magic didn’t work. My heart wasn’t in this. It felt too arduous. I should, I thought, have brought snowshoes. I stopped and dithered. It was too cold to spend long over a decision. I might regret not turning back. I might regret not going on. But the former was easier and less committing. I turned and began to retrace my steps down the mountain. I wasn’t happy with the decision, but I also felt I wouldn’t have been happy going on. By the time I reached the first trees I was fed up with myself and even considered just going home. That thought startled me. I certainly wasn’t going to do that. I wanted this night out. The Enchanted Waterfall. A grainy phone photo but it captures the feel. Nothing was distinct or sharp. On a whim I turned down a narrow, overgrown side path I’d seen many times. Soon I could hear water rushing. The Allt Fhearnagan, the stream that ran down the corrie below the main path. I pushed through some bushes and suddenly there was a lovely waterfall in a little amphitheatre. In the light of my headlamp it glowed a greenish yellow and the vegetation round the water shimmered indistinctly. I was entranced. Here was the magic of the night. My mood changed instantly. How wonderful to be here. I crossed the stream below the falls then followed it downwards past more sparkling falls and silvery waterslides. The water was smooth and silky and noisy and rough all at the same time. But what I noticed most was the way it and the trees shone whilst all around was blackness. A secret world. An enchanted forest. Whatever else happened the trip was now a success. Just that first sight of the waterfall was all I needed. Everything else just amplified that moment. 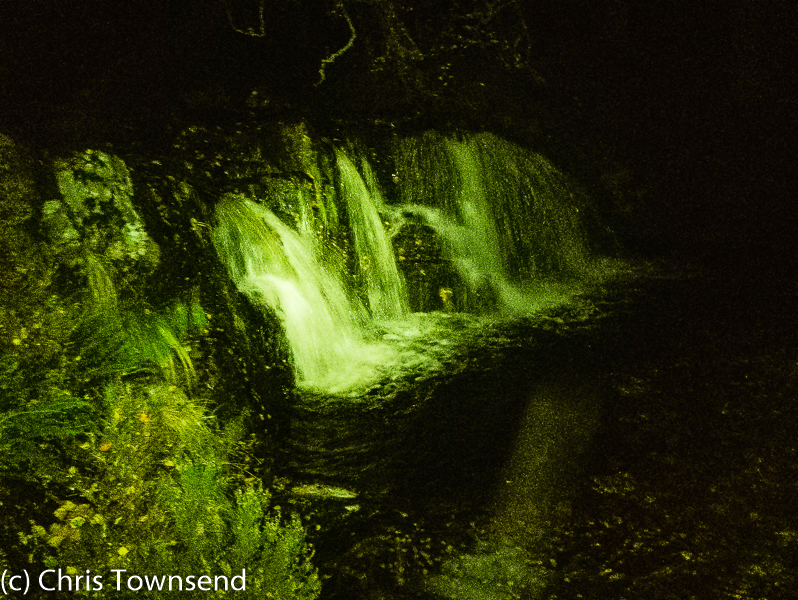 Eventually I left the water and walked through the trees to the next stream rushing down from the Moine Mhor. 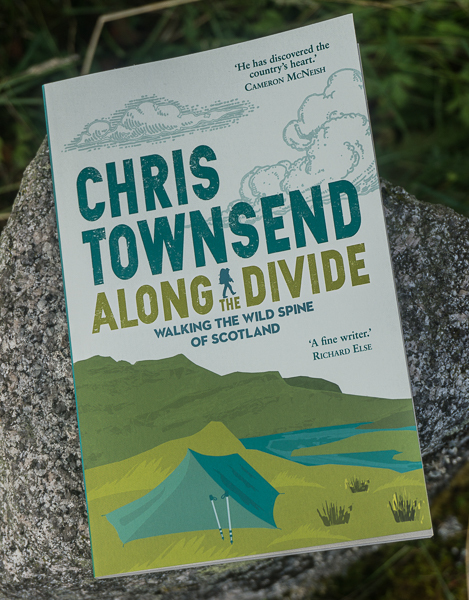 I followed this upwards until I found somewhere to camp close to two old Caledonian pines and sheltered from the cold wind by a steep bank. A bright waning moon cast a cool light. Dawn came with racing clouds and a frost. The sun lit up distance slopes but the bank that protected me from the wind also blocked the rising sun. I made way back along Glen Feshie admiring again the brilliant colours of the birches. In the open the wind was fierce and bitter. I reached the car just as sleet and hail began to fall. My short, unusual, but ultimately excellent trip was over. I'm usually reading several books at once. Recently I started the three above - one sent for review, one I contributed to on Kickstarter, and one a birthday present. All three look excellent. They're not the only books I'm reading though. I've been slowly working my way through Richard Fortey's The Wood For The Trees. 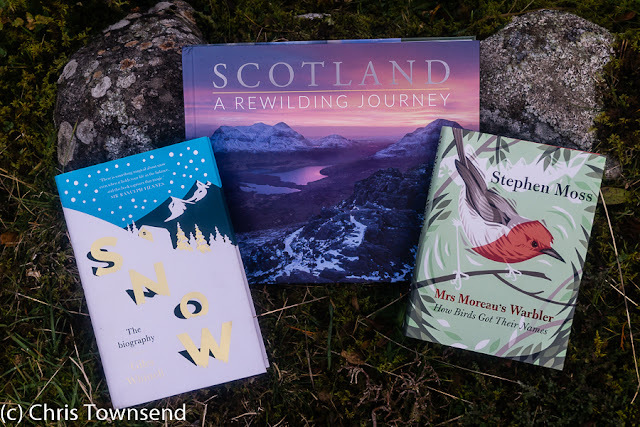 It's divided into seasons and whilst Strathspey is a long way from Fortey's southern England wood I've been reading sections at the appropriate time of year. I'm also reading Charles Dickens' Our Mutual Friend - I like to have at least one work of fiction in my pile of current reading and this is an old favourite. Two nights ago in a tent in Glen Feshie I was reading another old favourite - Edward Abbey. This was a mix of fiction and non-fiction (though with Abbey it's sometimes hard to tell which is which) as a collection called The Best of Edward Abbey was the only work by him I could find for my Kindle. I don't often take print books camping anymore. I like having a selection of options. With the Kindle I can carry a whole library. On my recent GR5 walk I read several very different books starting with Henry James' The Turn of the Screw. I was shocked again at the abrupt and disturbing ending - a real cliffhanger! I wanted to remind myself of the original after seeing an excellent theatrical version at the Edinburgh Fringe in August. Other GR5 books were John Burns' entertaining Bothy Tales; Mathias Rostrom's The Life & Death of Sherlock Holmes, a fascinating and exhaustive account of Holmes in popular culture from Conan Doyle to Sherlock and Elementary; and then, of course, many of the original stories in The Complete Sherlock Holmes. Even though they were familiar I found the Sherlock Holmes stories really good for unwinding in the evening, especially when the weather made staying in my shelter sensible. 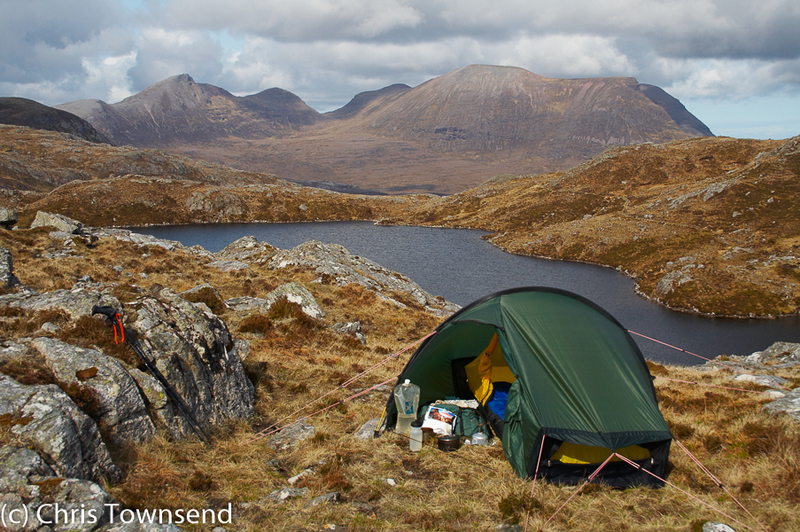 Next in the Classic Gear series that appeared in The Great Outdoors last year: a favourite solo tent. 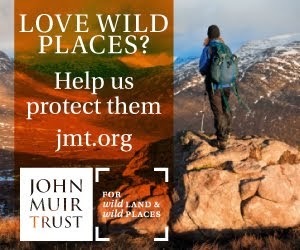 Back in 1996 I was looking for a strong light tent for my walk over the Munros and Tops. 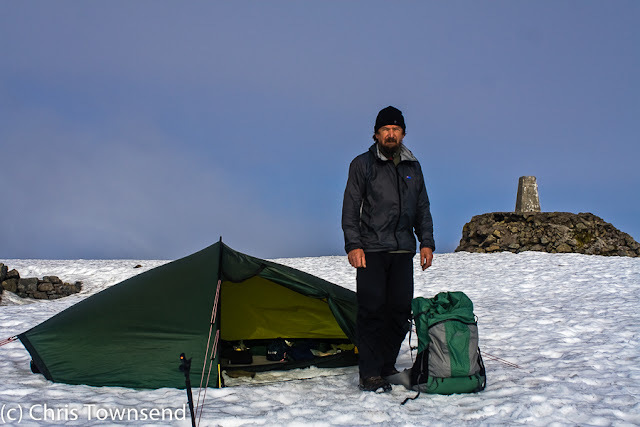 Four years earlier I’d used a Hilleberg Nallo 2 on a length of the Scandinavian Mountains walk and been impressed with the quality and performance. 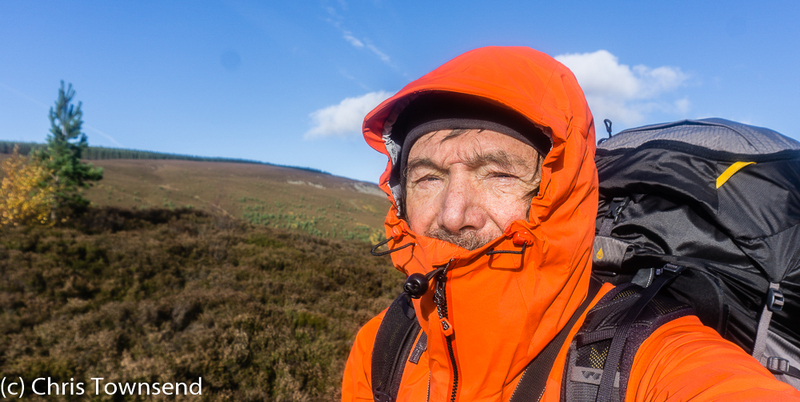 For this walk with hills to climb every day I wanted a lighter tent though, but also one that would stand up to the stormiest Scottish weather. I found it in the then new Akto, which had been launched just the year before. On my Munros and Tops walk the Akto surpassed expectations, coping with many big storms, and was still in good condition at the end of the four and a half month trip. That original Akto has also been to the Grand Canyon and the Himalayas, and on several TGO Challenges. Before the Akto Hilleberg didn’t make any solo tents – Akto means ‘alone’ in the language of the Sami, the indigenous people of northern Scandinavia – but company founder, owner and tent designer Bo Hilleberg thought there was a demand for one and, as he says, ‘I personally wanted one’! Any such tent had to live up to Hilleberg’s high standards though and be suitable for year round use with a double-skin construction and a roomy vestibule. Bo quickly worked out that to be lighter than the Nallo the tent would have to be a single hoop one. Finding the right design took Bo and his wife Renate quite a time though and they ended up making 17 different prototypes. A hoop running across rather than along the tent was the lightest design but not stable enough. Finally they tried adding two lightweight rods at each end and the now iconic shape was found though it still took much work to get the design just right. That they succeeded is shown by the number of Akto-inspired tents that have appeared from other companies, all with various configurations of rods at each end. The Akto was and remains a big success. The original design is so good it’s barely changed over the years, with just a stiffened hood added over the flysheet door so the zip can be left undone at the top for ventilation without letting rain in. The fabric is the same silicone nylon – a standard fabric for lightweight tents now but revolutionary back then, and there are still protected vents at each end. It’s always been easy and quick to pitch as a unit, keeping the inner dry in rain, and the vestibule is bigger than in most similar tents, big enough for a pack and wet gear and for cooking under cover. The weight hasn’t changed much either – 1.6kg in 1995, 1.3kg minimum weight and 1.7kg packed weight today. 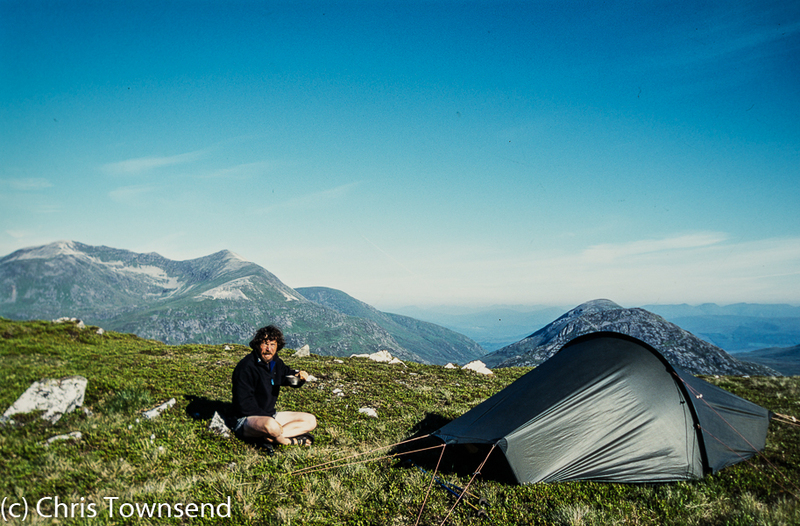 That weight was low for a solo tent in 1995, that’s one of the main reasons I chose it for the Munros and Tops walk. In recent years lighter tents from other companies based on the Akto design have appeared. They may not be as strong or as durable but they do save weight. A few years ago Hilleberg itself joined in and launched the three-season Enan, made from lighter fabrics and with a single rod at each end, weighing 1.1kg. The Akto doesn’t look dated today, twenty-two years after its launch. It’s a classic design and one I expect will be around for many more years. 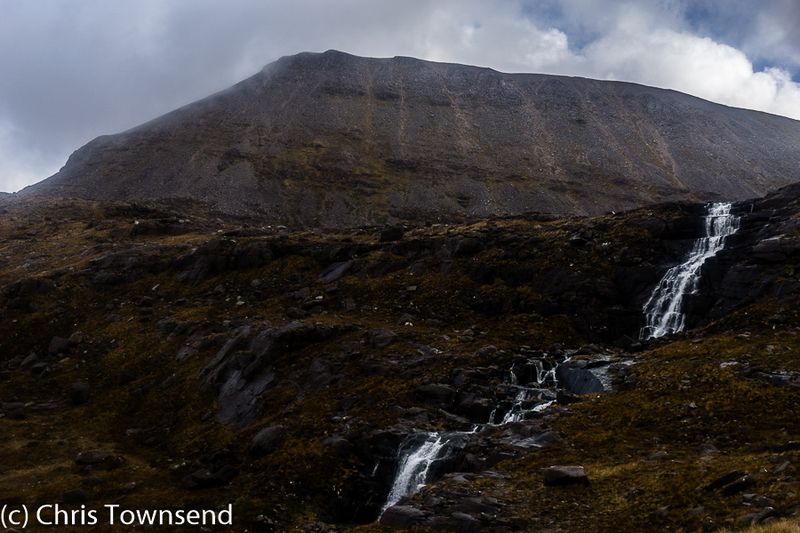 Unusually my first venture into the hills after my GR5 walk wasn't in the Cairngorms but far to the west in Torridon. 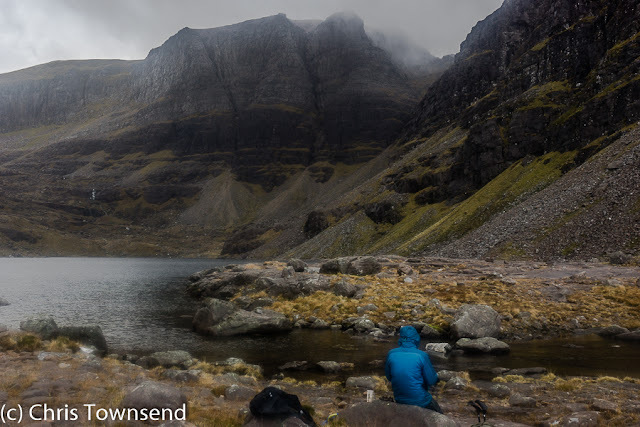 Back in the spring I'd been offered a couple of nights in The Torridon hotel and The Torridon Inn plus a day out with one of their instructors/guides, the deal being that I'd write about the experience. (There'll be a follow-up post on the hotel and the inn). I'd forgotten about this until a reminder came in just as I returned from the Alps. So a week after returning home I was away again for a couple of untypical luxury nights, with a day of storm inbetween. 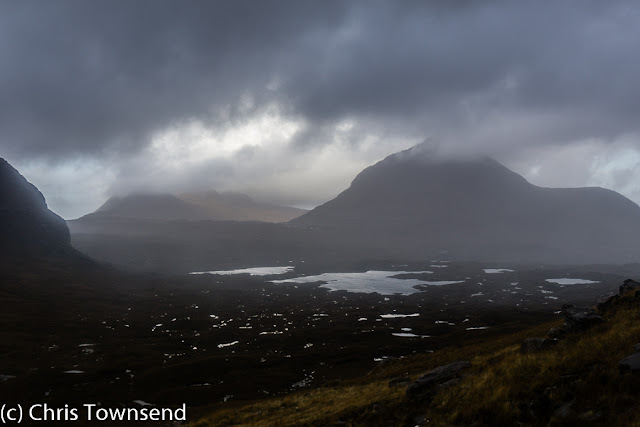 The forecast being for very wet and windy weather that should ease a little in the afternoon the Head of Torridon Activities at Torridon Outdoors, Charlie Burrow, suggested Beinn Eighe as there's a long walk-in so the worst of the storm might have passed by the time we were high up. The walk-in certainly was wild with a gusty wind, heavy rain, and low clouds shrouding the hills. On reaching Coire Mhic Fhearchair,a place that never fails to inspire and impress, the rain eased, though the wind was cold, and we stopped for a rest and a snack and the opportunity to admire the wild surroundings, the wave-swept lochan, and the great cliffs of the Triple Buttress, which faded in and out of the clouds. Threading a way through the rocky corrie we began the climb up the steep slopes to the col separating the high point of the mountain, Ruadh-stac Mor, from the main ridge. Looking back down the corrie we could see sunshine on hills to the north, which gave us hope the summit might clear. The ascent finishes up a loose scree and rock gully. We found the left-hand side a bit easier than the loose centre, with solid rock steps in places. 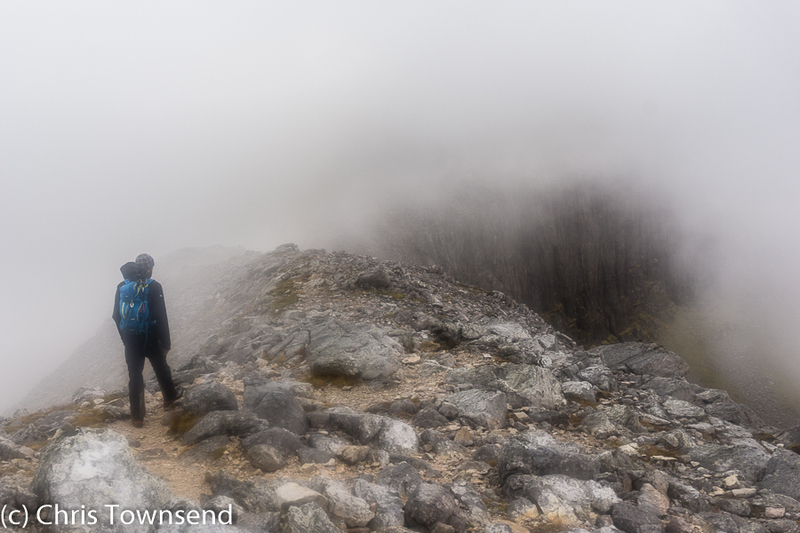 The top of the gully disappeared into the mist and on emerging from it we also felt the full force of the wind. As it wasn't far now we went to the summit - and stood there in the mist a short while. It wasn't going to clear. Turning away we went onto the main ridge where we decided to see if there was a direct way down to join the outward path in Coire Dubh Mor. 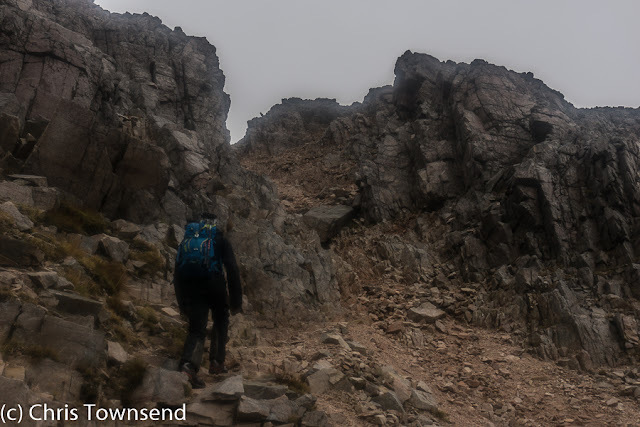 Both of us believed there was, though in my case my memory was faulty as the terrain I remembered from a descent on another wet misty day was nothing like as steep or stony as this turned out to be. A series of rock steps, steep loose scree chutes, and boulders had us traversing back and forth across the slope searching out the safest way. Far below we could see a path snaking across scree slopes. It took a while to reach. Much of the ground was so loose it slid beneath the feet. Care was needed! Lower down the larger rocks and little crags disappeared and there was just scree to slither down. 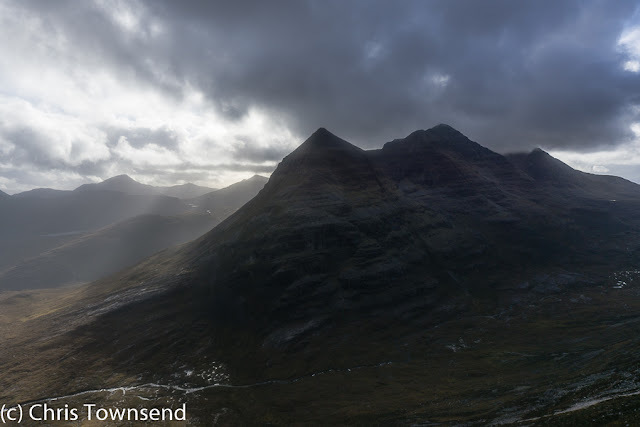 Whenever we paused and looked up - when moving eyes to the ground were essential - the great mass of Liathach reared up before us. 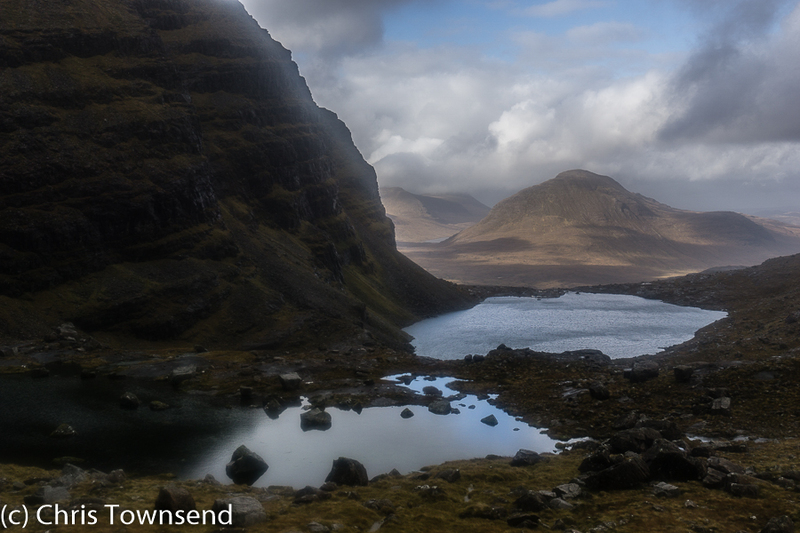 This really is a dramatic landscape, as fierce, wild and magnificent as anything I saw in the Alps. Despite the weather it was a great day out and it was good to have a companion for once. 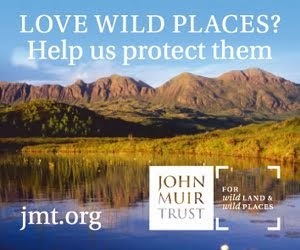 I learnt a bit about Torridon Outdoors too. A huge range of activities is on offer including mountain biking, sea kayaking, canoeing, wildlife watching, and gorge scrambling as well as guided high and low level walks. You don't have to stay in the hotel or inn to take part in them either. 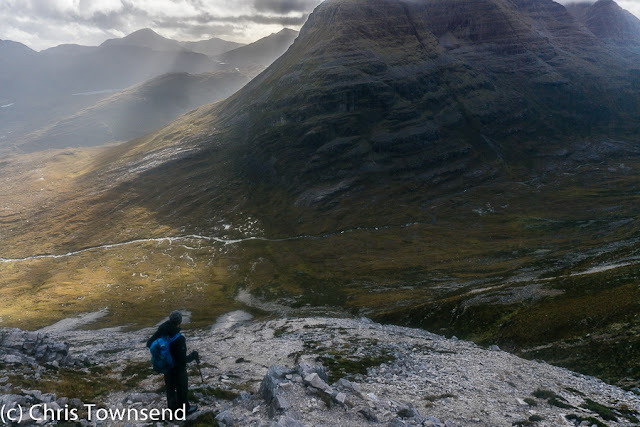 There's more about Charlie and Torridon Outdoors in this Q&A post from last year.